Thank you!!! These are good quality and very fast shipping. I also like the design of these and the lid too! Flask good, came in, packed well. but the picture is a jar with cover, and came with a holster. Did not communicate with. All super in describing recommend store and goods. Jar super. Thanks to the store. Good Product. GREAT protective Package, It arrived in perfect conditions! Thank you all well landed consignment arrived at destination in order and undamaged I am happy therefore I give 5 stars, positive feedback and recommend. Ok.
Todo perfect and very fast. it's kinda cool to have a steel bottle you can drink of riding. but it took me one time to drop it to have a huge ding in it. not sutable for racing - can't squize the thing, it takes time to drink out of. 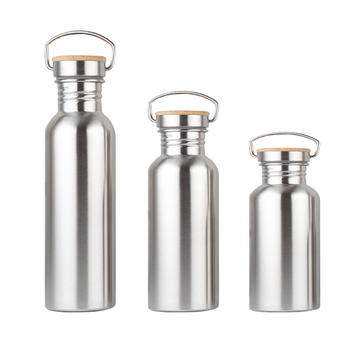 what is the health benefit of a steel bottle if the top is still made of kinda cheap plastic? fast shipping, .. fast shipping not stinks) more convenient and safe plastic bottles of expensive for little but better volume and shower which can choose.